If you love baking, owning a convection oven will help you get started and can even give you the confidence to explore the kitchen more. The consistent results of these ovens will allow you to prepare the same delish again and again. Aside from that, convection ovens are designed to fit in your kitchen countertop, so it doesn’t consume much space. Seeing the demand of convection oven buyers, we’ve created a list of the top 10 best convection ovens. The following are the best ovens that you should consider buying for they are the most innovative, sleek-looking, and advanced ovens available in the market today. There’s no doubt that Breville is one of the most reputable manufacturers when it comes to ovens and other kitchen equipment. This product is not an exception. 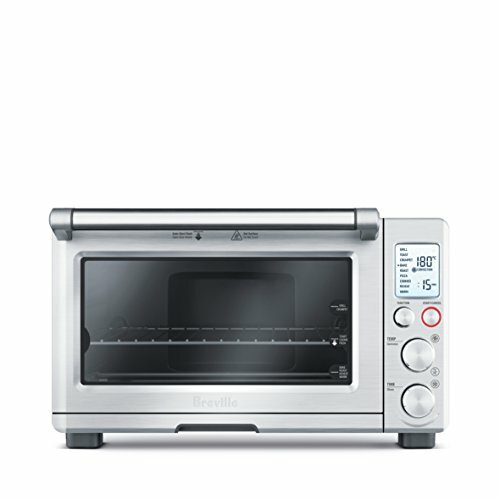 First on the list is the smart oven pro convection toaster from this manufacturer. It features an interior oven light for increased visibility of what you are cooking. The oven also has ten pre-set cooking functions that include toast six slices, bagel, bake, roast, broil, pizza, reheat, warm, cookies, and slow cook. This oven can accommodate up to 13-inch pizza and 6-slice toaster. The convection-powered oven with an inbuilt fan that will circulate the hot air inside the oven. In that way, cold air will be stripped away and makes cooking process a lot faster than usual. It also has a non-stick cavity coating so that it’ll be easier to clean and maintain. With proper usage, this convection oven can serve your family good food for years to come. Next, we have the Cuisinart convection microwave oven with grill. 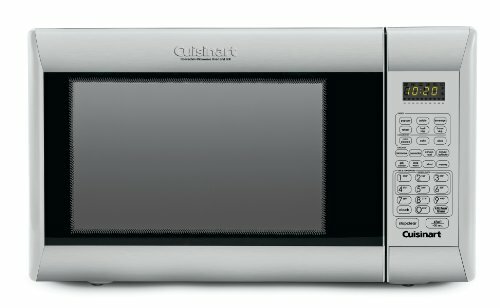 This 1.2 cubic-foot capacity model is made of brushed stainless with embossed Cuisinart logo and dark tinted glass window. The stainless steel interior will not absorb any odor from the food being cooked inside, and it’s easy to clean. You also have full control of this oven thanks to its reversible grill rack and rotating 12-inch glass tray. 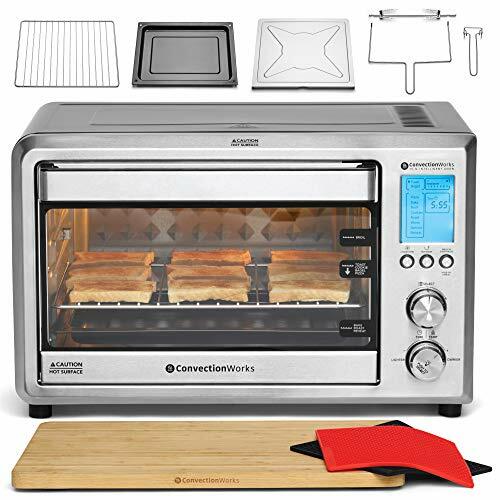 This oven is perfect for beginners at the kitchen for it has touchpad controls with LCD, two convenient defrost functions to defrost the food by weight or time, convection bake or roast with or without microwave function as you wish. Rest assured that this product is safe to use thanks to its BPA-free materials. Buyers can enjoy up to three-year limited warranty upon purchasing the product. 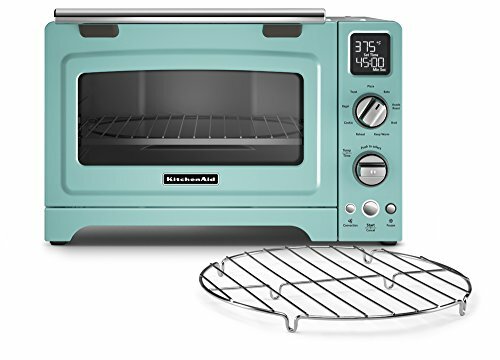 Check out this 1800-watt digital countertop oven from KitchenAid. It utilizes an even-heat technology that can provide consistent heat throughout the baking cycle to produce accurate results every time you cook. Thanks to its compact size, you can use this oven for baking pizza, broiling a side dish, or preparing toast bread in the comfort of your kitchen countertop. It also works by keeping an already cooked dish warm until you’re ready to eat it. This oven features nine pre-programmed functions such as the asado roast function that allows you to accurately adjust the cooking temperature from a high sear to optimal for superior results of roasting. It also has a 120-minute timer that you can set to remind you when your dish is ready and all cooked. This oven is a bit spacious; it can accommodate two 12-inch pizzas at the same time. We also like its non-stick coating for easy cleaning maintenance. The package includes a 12-inch non-stick multipurpose pan, 12-inch broiling rack, cooling rack, and non-stick drip tray. 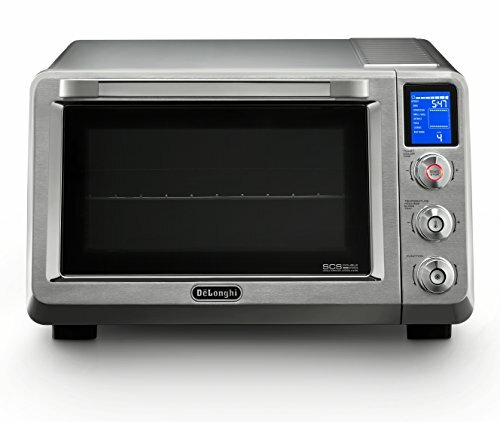 For tech-savvy kitchen lovers, we have the DeLonghi convection oven that utilizes an advanced heat guard technology. Now you can maintain the warmth of your food while maintaining the exterior of the oven cool and safe to touch. Compared to other convection ovens, it can cook food up to 40% faster, perfect for busy professionals. It also preheats up to 60% more quickly compared to other units. You can choose up to four adjustable positions that allow you to prepare meals faster and with no hassle at all. Compared to other convection ovens, an included internal light increases the visibility of the food that you are cooking. It’s also ideal for beginners in the kitchen thanks to its eight preset programs. The non-stick interior and removable crumb tray of the unit allows you to clean it without difficulty. It has a spacious interior yet it does not consume much space, an ideal choice for homeowners with limited kitchen space. 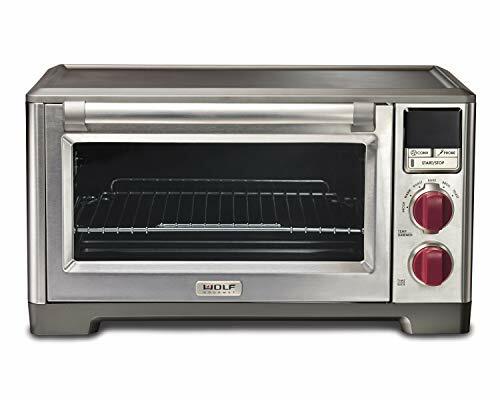 Wolf Gourmet is also one of the most reputable manufacturers when it comes to kitchen equipment and tools. If you are willing to spend a few more dollars, you should check out this product. It features a built-in temperature probe that quickly starts cooking the moment you plug it in. What we like about this product is the advanced convection function, an improved fan with high-volume airflow that will allow the heated air to circulate properly inside the oven. Rest assured that you can bake with no hot spots at all! Check out its accurate temperature control for cooking delicate foods. Now you will have the confidence to experiment more in the kitchen using this oven. Placing the dishes inside is a breeze thanks to its easy-to-glide rack that you can adjust in three different positions. Choose between six cooking modes, and you can start cooking and baking as you wish! 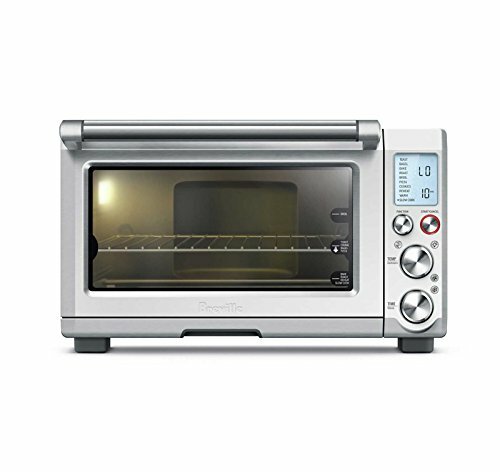 Another product from Breville is the all-new smart convection over in silver color. Featuring six independent quartz heating elements that will move the power above or below the food, you can prepare even the most intricate dish you could think of. It’s also an ideal choice for beginners in the kitchen because of its automatic adjustments and accurate temperature control to ensure the great taste of the food that you are cooking. Also, compared to other products we’ve reviewed, it features an air frying method. The increased heat and advanced convection technology will allow the heated air to circulate thoroughly inside the oven for crispier and tastier food. It features two-speed fans that you can choose from, making it an ideal choice for dishes that need dehydrating. The unit features 13 pre-programmed settings that will serve as your guide if you are still not expert in baking and cooking using an oven. 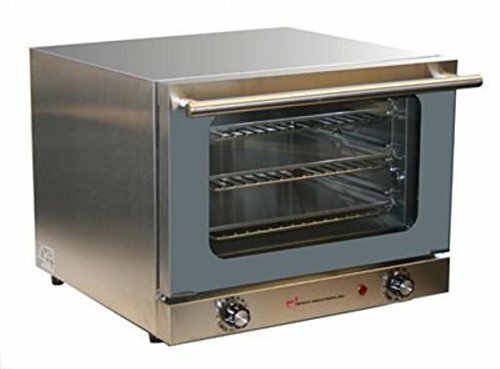 Introducing the Wisco convection countertop oven featuring adjustable and accurate temperature settings. Now, preparing homemade delicacies has never been easier for this product. We also like how its compact size does not consume much space, ideal for homeowners who have limited space in their kitchens. It also features an even air distribution to avoid burnt crisps and unpleasant cooking results afterward. It’s not only functional but also a sleek-looking convection oven that can fit any modern kitchen. The solid construction is built to last. With proper use and maintenance, this convection oven can last for a long time. The non-stick interior also means it’s easier to clean and maintain in the long run. Featuring the all-new oven from ConvectionWorks, the perfect solution for customers on a tight budget. This 10-piece all in one set includes the convection oven, quality bamboo cutting board, cooking pan, wire rack handle, two potholders, and easy-to-clean tray in a reasonable price. It includes a recipe book that’s ideal for a novice in the kitchen. For easy cleaning maintenance, it also features a Teflon-free non-stick interior. What’s great about this unit is that it doesn’t require any setup at all. It’s ready to use right outside the box and will automatically start cooking the moment you plug it in. Automatic adjustments for the appropriate time and temperature according to the dish that you are planning to prepare saves both time and money in the long run. 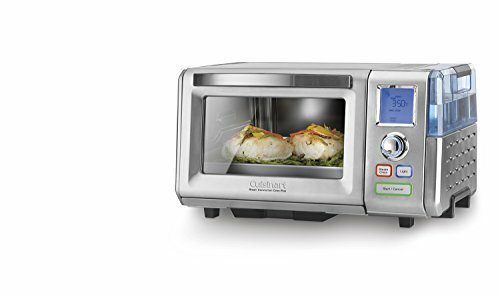 Check out this 1800-watt rating convection oven from Cuisinart perfect for delay cooking with 120 minutes of steady, uninterrupted steam. This unit is designed for bread proofing technology, bakes, and proofs bread for better and faster homemade baking at the comfort of your own home. We also like its steam clean technology that can cook up to 40% faster compared to other standard conventional ovens available in the market. It can accommodate up to 4.5 pounds for serving large families. The Cuisinart is also one of the well-known manufacturers in the market, giving you a peace of mind that it can last for a long time. 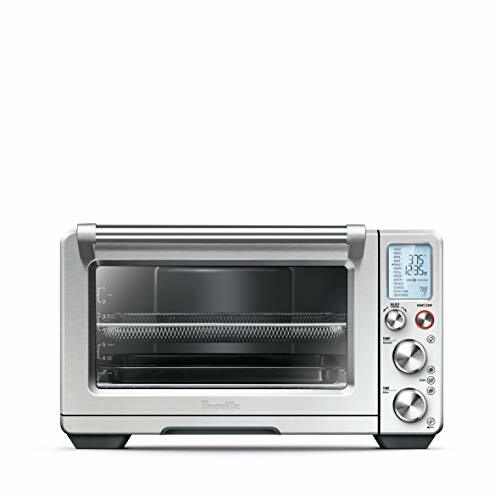 Another product from Breville, a budget-friendly convection oven with element IQ that can provide the appropriate power that you need to cook delish to its perfection. Do not worry if you are still new to baking because of its nine preset functions, keeping the food warm until you’re ready to eat it. The backlit and easy-to-read LCD provides optimal convenience from blue to orange while you are cooking. It does not also consume much space, making it a practical choice for people who do not have much space in their kitchens.